Actually, they lasted until about 1979. You might say those two kids are on a sugar high ... and you'd be right! I believe that when these first came out, they were little round balls just like Kix cereal, then later they were changed into little jet planes, but still tasted the same. 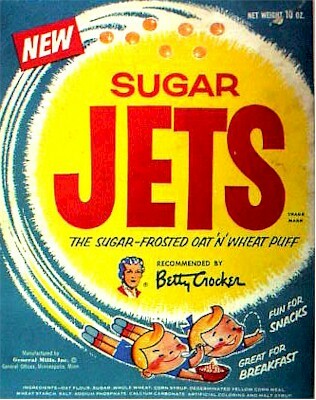 Of course years later they became just plain Jets, as the word, sugar became taboo. Post's Sugar Crisp became Golden Crisp and Kellogg's Sugar Corn Pops became just Pops! Jets now are long gone.